Show them your love with this vibrant heart, made from mixed media and Bo Bunny's Love & Lace I Want It All Bundle ! And I'll SHOW YOU how to make it, on this romantic and elegant card that could be given for not only Valentine's Day, but an Anniversary, Birthday, or just to say I miss you! 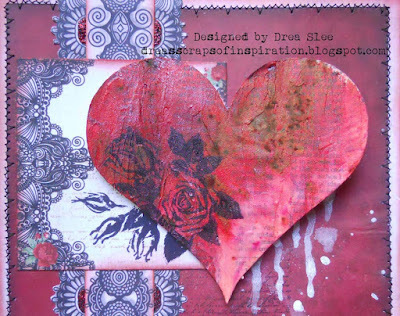 Check out How to Craft a Love & Lace Mixed Media Heart by FotoBella Papercrafting Supplies on Snapguide. 1. 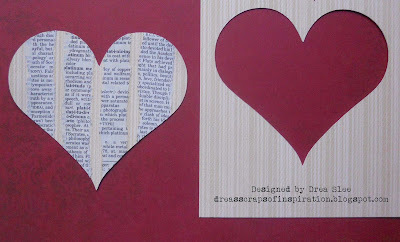 Cut or trace heart from cream striped cardstock that comes in the Ephemera. I used my Cricut Expression and the Plantin SchoolBook cartridge at 3 1/2". 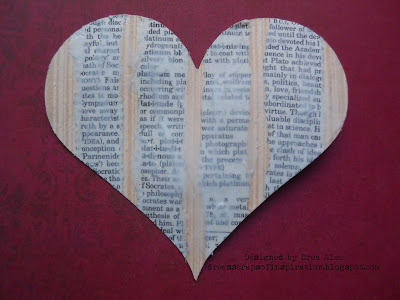 Then tear vertical strips from the dictionary paper that's also included in the Ephemera, and glue to the heart, cutting around the excess edges. 2. 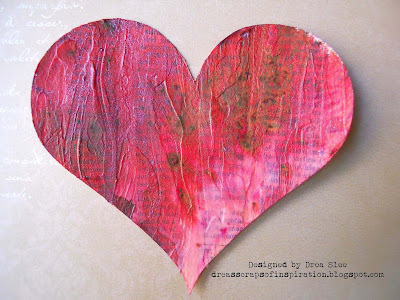 Cover the entire heart with gesso, making vertical strokes when applying. It's kinda hard to see the texture here, but make sure to let it dry completely before applying your sprays. 3. Spray your heart, and while it's still wet, use a toothbrush dipped lightly in the jar of LSG Magical, and flick it randomly, which creates almost a sandy texture. You can see where I used it here in the center and along the right. 4. 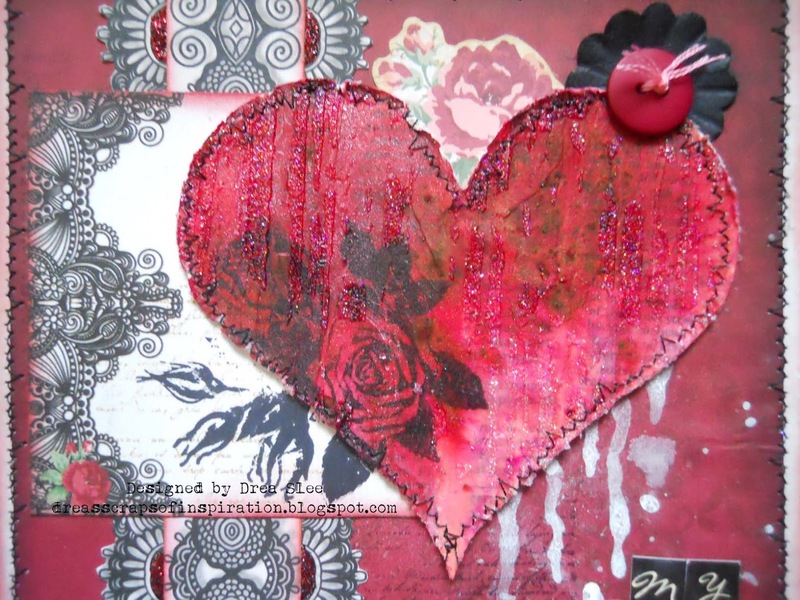 Place heart without adhering it, where you want on your card, and stamp rose cluster, using the Bo Bunny Floral Stamp and Ranger's Archival Black Ink, onto the heart and background at the same time. 5. Take your heart off and apply some Glitter Paste (Sugar) with the Tim Holtz Stripes Stencil. 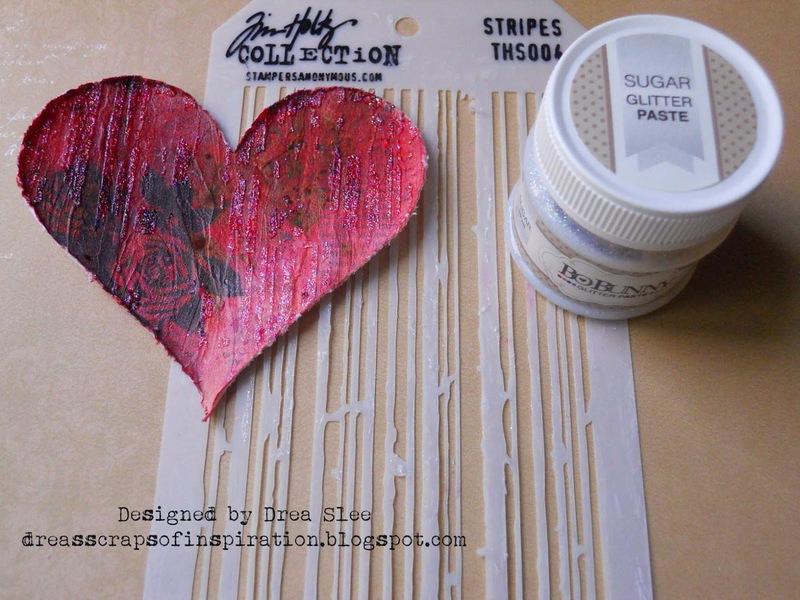 Once dry, use the Tim Holtz Paper Distresser around all of the edges. 6. Now sew around the edges, after tucking in the pink flower that comes in the Noteworthy pack. The button, black alpha stickers that spell "my", and the black flower are more goodies found in the Ephemera pack. I carefully removed the top layer of "Love" from the Layered Chipboard, eliminating the back, floral layer, for a cleaner, masculine look, since this is now my husband's second Valentine's card. But he deserves both! 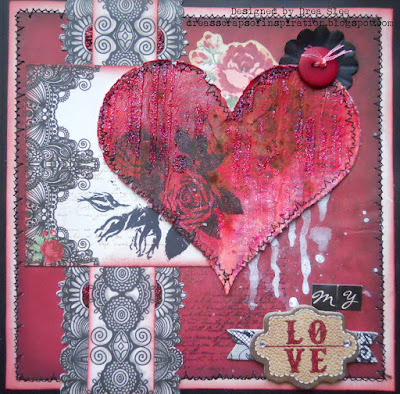 Thanks for looking, and stop by FotoBella to see what's new! It's really beautiful Drea! You did such a nice job! Thanks for sharing such a nice information in this blog.